Crawdaddy! It was the first US magazine of rock music criticism, preceding both Rolling Stone and Creem. Paul Williams, then a student at Swarthmore College, first launched the magazine in 1966. 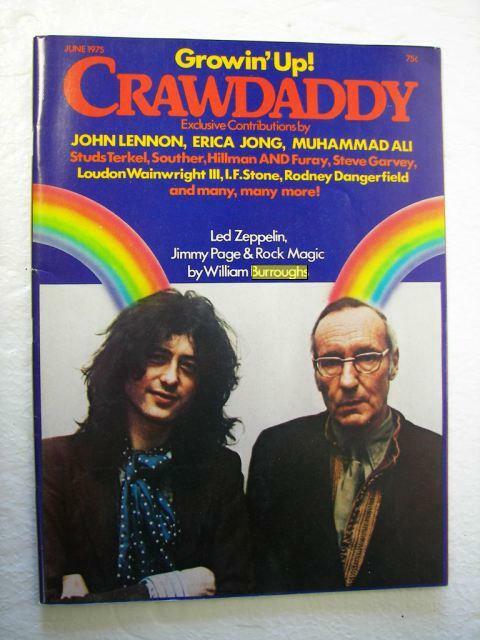 And by the 1970s, Crawdaddy! hit its stride, publishing exclusive contributions by John Lennon, Joseph Heller, and Studs Terkel, to name a few. On one occasion, the self-described "first magazine to take rock and roll seriously" sent William S. Burroughs, the great beat writer, to a Led Zeppelin concert. He came back in June 1975 with a rather offbeat concert review. There's a strange innocence, even naivete, to the whole piece (though we know better than to confuse Burroughs himself with innocence). We give you an excerpt right below, and the rest here. The Burroughs piece continues here.